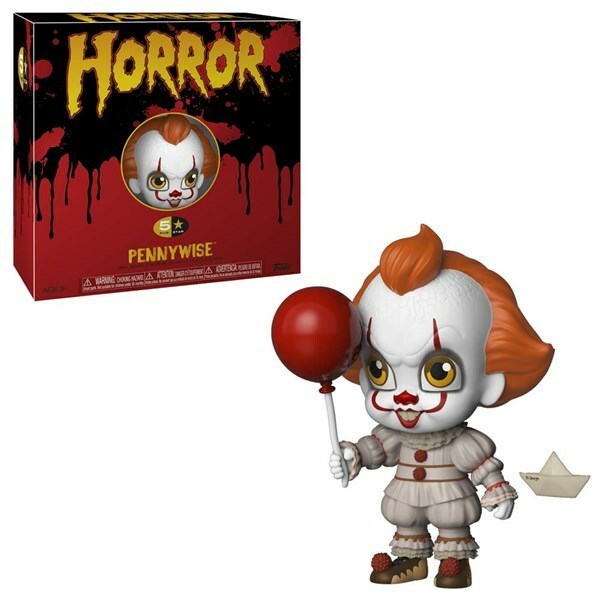 Pennywise is the form a malevolent entity takes while it preys upon the children of Derry, Maine. Appearing roughly every 27 years, using a variety of powers that include the ability to shapeshift, manipulate, and go unnoticed by adults IT wreaks havoc on the small community. Funko is thrilled to dive deeper into the world of storytelling and pop culture with their latest line of collectible vinyl figures - 5-Star! Here we have your favourite characters from the world of Stephen King's IT, which have been uniquely brought to life once again with the 5-Star treatment. Standing 4" tall, this vinyl figure features IT as Pennywise the clown holding his red balloon and complete with Georgie's paper boat.